1918 - 39 CZECHOSLOVAKIA 1918-39 full box scattered stamp. and parcels from of whole period republic. All in/at 1 larger box, total 1,90kg. 1919-39 CZECHOSLOVAKIA 1918-39 selection of sheets and their/its part/-s, i.a. contains Coat of arms 10h parchment 1/2 sheet, complete sheet OT 10h Sokol, BIT 3x complete 50 pcs of sheet, issue 30. years, air-mail III. 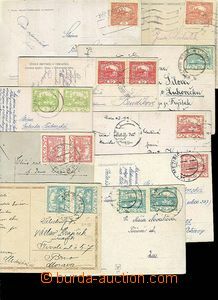 issue set 50 pcs of sheets 50h and 30h etc..
1918-50 CZECHOSLOVAKIA 1918-39 selection of unstuck stamp. in paper bags and envelopes + 2 stockbooks. Contains stamp. also from Austria, Germany, CZECHOSLOVAKIA 1945-92 All in larger box, total 2,5kg. 1919 CZECHOSLOVAKIA 1918-39 specialized selection of charitable military stamp. Pof.PP2-3, types, margins, paper crease, defects perf, color, offsets, PLATE PROOF, refused designs, + Lion Pof.PP5, PP6 - shifts added-print, inverted additional printing 1920. Interesting. 1918-39 CZECHOSLOVAKIA 1918-39 almost complete (without Hradčany issue), slightly specialized collection on sheet Schaubek in 2 spring folder Supplemented with several entires to individual issues. Major part cennějších stamp. expertized. Catalogue Pofis without entires ca. 40000CZK Interesting offer, We recommend it! 1918-23 CZECHOSLOVAKIA 1918-39 accumulation used stamp. typography issue in/at 1 new 16 sheet stockbook Pofis. Contains issue Hradčany, Pigeon-issue, issue Chainbreaker and issue Agriculture and Science. 1918-38 CZECHOSLOVAKIA 1918-39 reserve stamp. in/at 1 stockbook A4, contains Hradčany, POŠTA / ČESKOSLOVENSKÁ / 1919, Pigeon-issue, issue Chainbreaker, issue Agriculture and Science, Airmail I. - III. issue, SO 1920. Z better pieces contains Pof.26a, 81, 147 pair with double print, 156N, 169N, 180-82, 183-86, pair 17 with overprint for Red Cross, L1-L3, L1A, L2A, L3B, L4-6, DL19 frame type, offsets overprints SO 1920 etc.. High catalogue. 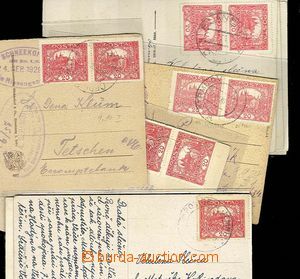 1918-20 CZECHOSLOVAKIA 1918-39 post revolutionary postmark on/for Hradcany-issue stmp, selection of 1590 pcs of stamp. with various quality copy-print, all in 6 notebooks A4. 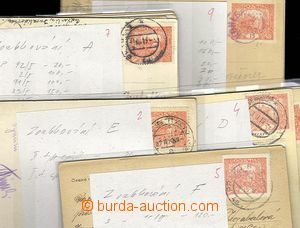 1918-20 CZECHOSLOVAKIA 1918-39 collection Hradčany-issue used stamps, strips, shades, perf, plate defects, various postmark etc.. on album sheets Z estate Gösty Hedboma. 1939-45 BOHEMIA-MORAVIA selection of whole sheets (St. Vitus) and their/its part/-s, bands, gutter - Linden Leaves, coupons, plate mark. Various quality, part stains. 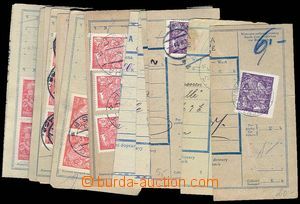 1939-44 SLOVAKIA more/larger accumulation in 3 stockbooks A4 + 3 stock sheets Contains all issue incl. overprint (only lower values), supplemented with about/by blocks of four, plate mark etc.. High catalogue! Profitable offer! 1945 CZECHOSLOVAKIA 1945-92 Košice-issue, comp. of stamps on stock-book sheet A4, 92 pcs + 8 bloks of four and stripe. Various defects and shades. 1945-89 CZECHOSLOVAKIA 1945-92 small collection with lot of duplication in 2 big and 2 small stockbooks + 18 stock-book sheets and paper crease with blocks and parts sheets. All in/at 1 box. Interesting, high catalogue value! Profitable offer! 1945-92 CZECHOSLOVAKIA 1945-92 incomplete collection of stamps on sheet A4 in/at office šanonech. 1945-80 CZECHOSLOVAKIA 1945-92 incomplete comp. of stamps in 3 smaller stockbooks, strongly contains years 1965-75, souvenir sheets from 50. years, air-mail from y 1946. 1949, complete set from 50. and 60. years. High catalogue. 1945 CZECHOSLOVAKIA 1945-92 / REVOLUTIONARY OVERPRINTS collection more than 500 pcs of stamps in/at small stockbook A5, more than 30 various sorts. Several complete sets Major part clear mint never hinged, small part without gum or used. 1964-90 CZECHOSLOVAKIA 1945-92 collection commemorative prints MF, total 27 year, missing 1. year/volume. 1945-49 CZECHOSLOVAKIA 1945-92 selection of sheets and their/its part/-s in/at 1 exercise-book, contains 2x whole sheet Pof.246-3, the bottom bnd-of-20 newspaper with plate mark etc.. Various quality.